Because of structural flexibility and acid lability, the identification of phosphorylated lysine (pLys) peptides is a great challenge. 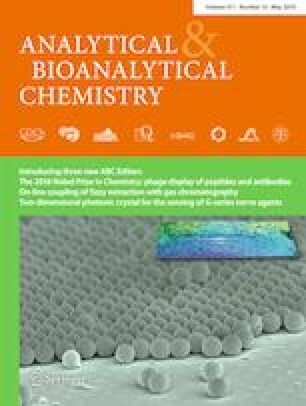 We report here a cleavable hydrophobic derivatization (CHD) strategy for the enrichment and identification of pLys peptides. First, 2,5-dioxopyrrolidin-1-yl-3-(decyldisulfanyl)propanoate was synthesized to react with dephosphorylated lysine peptides, and then the derived peptides were captured by a C18 column, followed by cleavage of the hydrophobic chain, with the specific label left on the target peptides for further identification. By CHD, the enrichment of pLys peptides from interfering peptides (1:1000 mass ratio) was achieved. Furthermore, CHD was applied to screen the pLys targets from Escherichia coli lysates, and 39 pLys sites from 35 proteins were identified. Gene Ontology (GO) analysis showed that these proteins played vital roles in catabolism, metabolism, biogenesis, and biosynthetic processes. All these results demonstrate that CHD might pave the way for comprehensive profiling of the pLys proteome. The online version of this article ( https://doi.org/10.1007/s00216-019-01770-w) contains supplementary material, which is available to authorized users. The authors are grateful for financial support from the National Key Research and Development Program of China (2017YFA0505003), the National Natural Science Foundation (91543201, 21505133, 21725506), the Chinese Academy of Sciences Key Project in Frontier Science (QYZDY-SSW-SLH017), and the Innovation Program of Dalian Institute of Chemical Physics, Chinese Academy of Sciences Key (DICP TMSR201601). Murat S, Bigot M, Chapron J, Konig GM, Kostenis E, Battaglia G, et al. 5-HT2A receptor-dependent phosphorylation of mGlu2 receptor at serine 843 promotes mGlu2 receptor-operated Gi/o signaling. Mol Psychiatry. 2018. https://doi.org/10.1038/s41380-018-0069-6.